I can never remember a time that I didn’t consider myself a feminist. Even as a little girl, I never considered myself “less than.” I never doubted that I could do what I wanted to do. So this week I wonder: Why is that? Part of it was probably that my mother was often the main breadwinner in our house, devoted to a job she didn’t always like but that kept us insured while my dad floated from psychology and social work to construction jobs. The other part, I think, was growing up watching women such as Stevie Nicks, Debbie Harry, Chrissie Hynde and Madonna – women who wrote their own songs, headlined their own shows, and worked with men but didn’t rely on them for their success. This was normal to me. Watching Nicks and Pretenders frontwoman Hynde on Thursday at Spectrum Centre, I was reminded of that early female power. The endurance of Nicks’ friendship with backup singer Sharon Celani, who has been with her since the start of her solo career, plus her obvious generosity as a boss whose band members have been with her for decades, and her witchy-earth-mother persona, were reminders of her strength and ours. I’d been worried by reports of the 24 Karat Gold Tour’s “VH1 Storytellers”-style vibe that the show would be a low-key one, heavy on ballads and adult-contemporary songs. But the format was what made it so special. Nicks seemed stiff her last time through town, with Fleetwood Mac. This night, freed of having to squeeze in Mac’s plethora of hits, she was physically looser, vocally stronger, and spoke at length and off the cuff. She and her eight-piece band – coming on after a Pretenders’ set where Hynde sported an Elvis tee and a smoky voice that’s still perfection – reveled in lesser-known tracks. Those included “New Orleans,” which she wrote as Hurricane Katrina loomed, and “Starshine,” which she cut from an album because she didn’t like the label-approved version. Her stories about writing the encore “Leather and Lace” for Waylon Jennings and Jessie Colter, and its evolution – on the advice of then-boyfriend Don Henley (who would tell her, as she was writing it, when the song wasn’t working) – were precious and funny. She performed “Bella Donna” and “Wild Heart” – title tracks to her first solo albums – in the same silk chiffon shawl she donned on the back cover of “Bella Donna.” The garment is intact after 35 years, she said: a testament to the fabric. 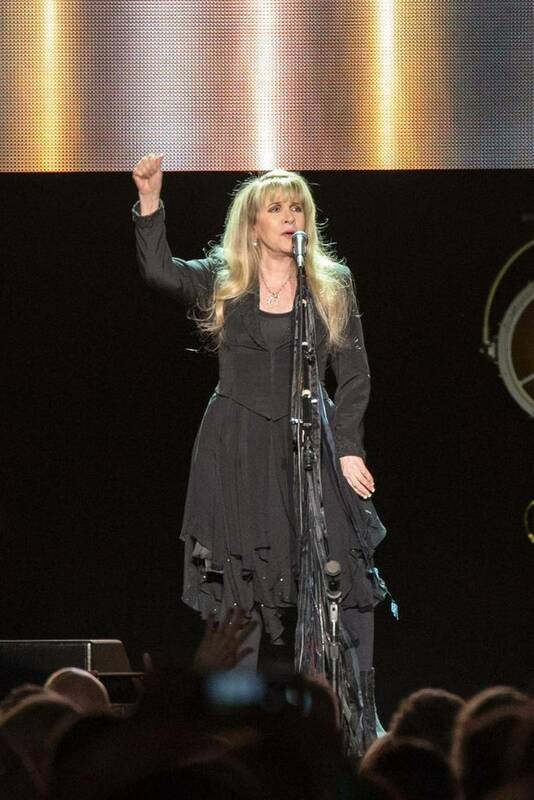 The most emotional performance was “Moonlight (A Vampire’s Dream),” a song inspired by the second “Twilight” film that launched Nicks back into recording after a self-imposed, nine-year break. And “Crying in the Night” was a treat for fans of the pre-Mac “Buckingham/Nicks” album: It stood up, 45 years after being written. “Gold Dust Woman” served as a showstopper, with Nicks dancing and shaking her hair, then challenging the audience – many of whom were in her age bracket – to do the same when they got home. Stevie Nicks rolled into Charlotte, North Carolina on November 10 and she brought the Pretenders along with her on her 24 Karat Gold Tour. Now, just stop for a moment and process something. Those two acts have almost 100 years of musical experience between them. Just take a few minutes to think about how amazing that is and of all the amazing music that they have given to us. With that in mind, we knew that we were in for a treat at this show because we were about to witness musical royalty up on that stage.